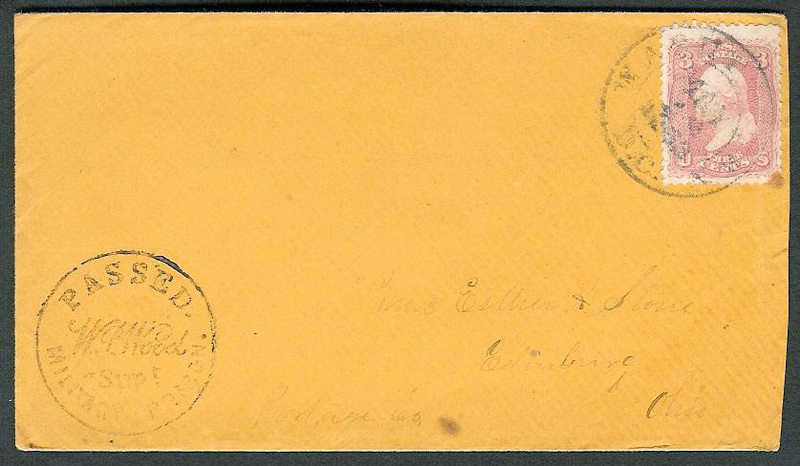 DESCRIPTION: SCRAP Number 24-124-01 (Figure 1) is an orange cover franked with a single U.S. 3 cent rose 1861 issue, perforated 12, postmarked with a black, double circle WASHINGTON/MAY 4 1863/D.C. cds which is used as the cancellation, with also a black PASSED/W.P. WOOD SUPt/MILITARY PRISON circular handstamp, and addressed to a Miss Esther A. Stone, Edinburg(h), Portage County, Ohio. SCRAP Number 96-108-28 (Figure 2) is similar in many respects, except that it is a yellow cover, the Washington, D.C. cds is incomplete, and it is addressed to a Mrs. Geo(rge) L. Prescott, Concord, Massachusetts. APPARENT USAGES: Fully prepaid 3 cents per half ounce domestic postage rate for a letter being sent from the Old Capitol Prison (being used as a military prison during the Civil War) in Washington, D.C. to Ohio or Massachusetts. 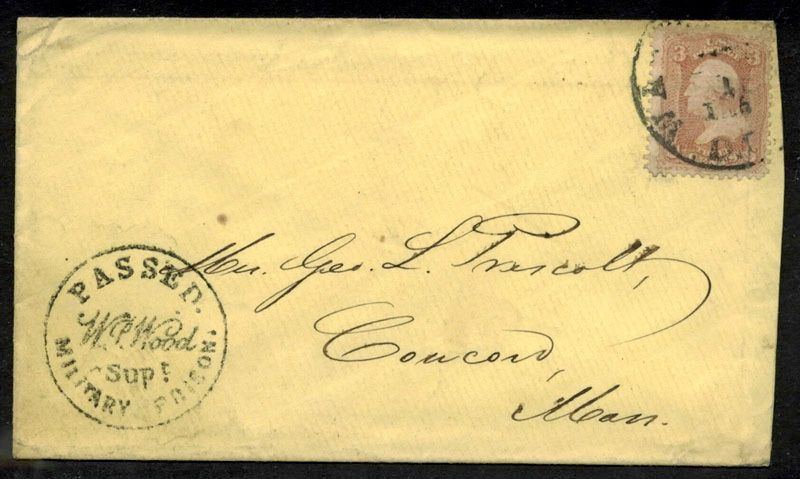 ANALYSIS: The franking on each envelope is a genuine 3 cent 1861 issue, Scott #65. The stamp on the cover to Ohio has a perforation stain at the lower left corner and both have several short perforations. A short horizontal bar just in front of the “A” in “SUPt” (see Figure 3) is constant in all fakes and not present on the genuine handstamp. Figure 3. An enlarged view of the handstamp showing several of the described characteristics that indicate it as a fake. Note particularly the break in the outer frame above the “A” and the short horizontal bar in front of the “SUPt”. The circular handstamp on the fake covers is well struck and upright, whereas on genuine covers is often found partially stuck and/or at various angles including upside down. Most fake covers bear U.S. #65 franking with a Washington D.C. postmark and are addressed to northern addresses, although a few are known with CSA stamps and Richmond postmarks to simulate through-the-lines covers. Although it cannot be conclusively proven, these covers may be the fakery of John Fox, a now deceased postal history dealer and auctioneer. The cover in Figure 2 was part of a large group of postal history covers donated to SCRAP in 1996 which were reported to have been obtained from John Fox and believed by the donor to all be his fakes. Whether or not these two covers are his work, they clearly are dangerous fakes. Other examples may be still in the marketplace, and collectors who have one or more covers with this handstamp should check them for the characteristics noted above. CONCLUSION: The faker took otherwise genuine 3 cent 1861 issue covers from Washington, D.C. to Ohio and Massachusetts and applied a fake PASSED/W.P. WOOD SUPt/MILITARY PRISON circular handstamp to each to create the appearance of Civil War prison mail.